Figure 1. Closure helps us understand the final panels of “Batman: The Killing Joke: The Deluxe Version.” Image Source: Alan Moore. (2008). DC Comics. Batman: The Killing Joke: The Deluxe Version. Closure explains what happens in between the panels. The audience comes up with their own interpretation of the gap between panels, and this interpretation can be different for each audience member. It can also be used for the reader to interpret what the ending of the comic means by the use of the panels. Scott McCloud in his book, Understanding Comics, describes closure as a “phenomenon of observing the parts but perceiving the whole.” (p. 63). For example, a panel depicting a mysterious woman looking at a blank paper might be followed by a drawing of a sunset. The reader will most likely conclude that the mysterious woman drew the sunset. But what if she stole it from someone and is claiming it as her own? A lot can happen in between two panels and it’s up to the reader’s mind to decide what that is. McCloud also has a classic example of closure in his book. In figure 2, it shows the two panels where the closure happens. The first panel is a man about to be killed by an ax. The next is just a panel saying “EEYAA! !” As the reader, you decide what is happening between the two panels. Did the man die? Is he crying out in pain? McCloud says, “To kill a man between the panels is to condemn him to a thousand deaths.” You are basically holding the ax and deciding where it lands. That is powerful and essence of closure. Figure 3. Page 130 in “A Wrinkle in Time” adapted and illustrated by Hope Larson shows the use of closure being used between all three panels. Batman: The Killing Joke: The Deluxe Version is an amazing example of closure. 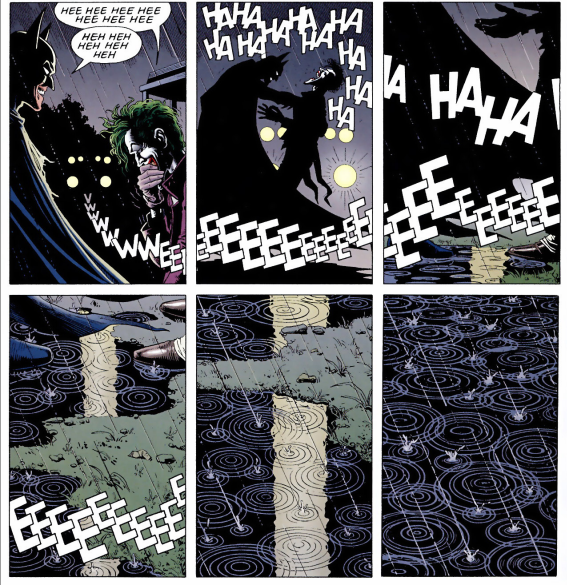 In the final scene, pictured to the right, there are panels between the Joker and Batman. There are many ways the reader can conclude the comic. Batman could be killing the Joker because the laughter stops in the final two panels. The car lights could be representing that they might both be dead. The panels are designed in a way that the reader has to decide what happens in the final issue of this comic. Many people in the comic book world have come up with their own conclusion about what Alan Morrison wanted to happen at the end of his iconic comic. Hope Larson’s A Wrinkle in Time is a graphic novel that adapts the classic young adult novel. This science related comic follows a girl going into time to find her missing father. There are many scenes where mysterious things happen leaving the reader to decided what is actually going on that’s unseen. In Figure 3, they are being sucked into something that is supposedly taking them into time. But the comic never actually shows you what happens in the scene right before the blackness. That’s where closure comes in and your mind will automatically come up with whatever it wants there. You get to decide if there body breaks up into million particles and then comes back together in the new time zone. Or if there bodies are just zapped into the time zone in one piece. Figure 4. This strip is an example of how Schulz uses closure to let the reader decide how Charlie Brown’s life goes. Image Source: Charles M. Schulz (2004) The Complete Peanuts. United Feature Syndicate. A third example is from the comic strip Peanuts. Figure 4 shows the last two panels of the comic. Charlie Brown always has a difficult time and most people forget that he is there. So the last two panels is him calling to tell his friends that he will be late but they said that they didn’t even notice he wasn’t there. It’s ended by saying that’s the way it goes. 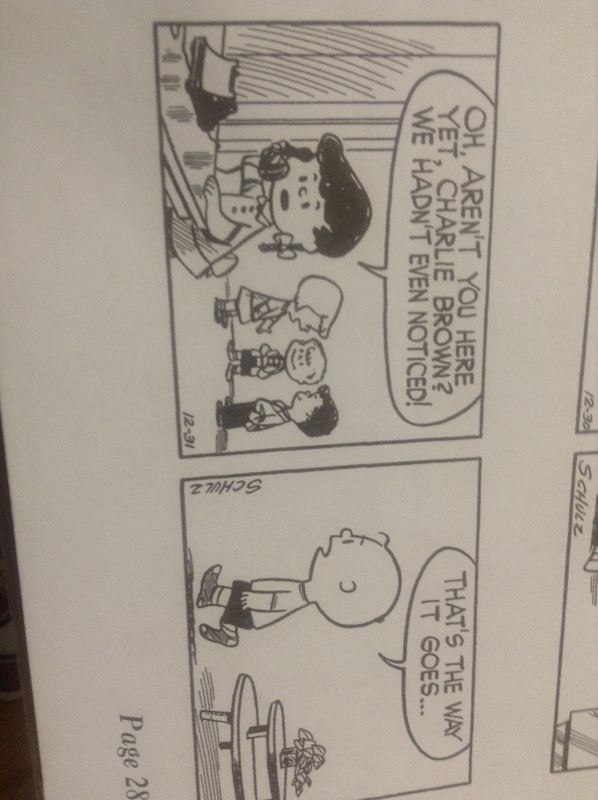 The reader here might decide the rest of Charlie Brown’s life without even realizing it. The reader might think that he will live the rest of his life being an afterthought, that he just accepts his fate. Or the reader might feel empathetic for him and think that he might grow out of that and make himself known. Charles Schulz makes it so the reader can decide the rest of his life by just the last couple of panels. McCloud, Scott. (1993) Understanding Comics. New York, NY: HarperCollins Publishers.